Alexander Kostan wore the same black shorts, black crop top and jelly heels as on Saturday night when a UNLV fraternity was holding an event. Kostan, and a group of about 20 other students, asked the university to shut down the Kappa Sigma fraternity, and presented a list of several other demands related to the incident. “I think UNLV could have done better on reprimanding this fraternity, immediately,” Kostan said. A member of the Kappa Sigma fraternity, Alex Parra, said that the organization does not allow nonpaying members to attend events outside of the recruitment period. Saturday’s event, he said, was outside the recruitment period. Other members of the fraternity who attended the protest refused to respond to a request for comment. Parra said his fraternity has stayed “peaceful and nonviolent” despite being harassed on social media. “This person continued to threaten my fraternity that we would be kicked off campus and kept verbally abusing us,” Parra said. 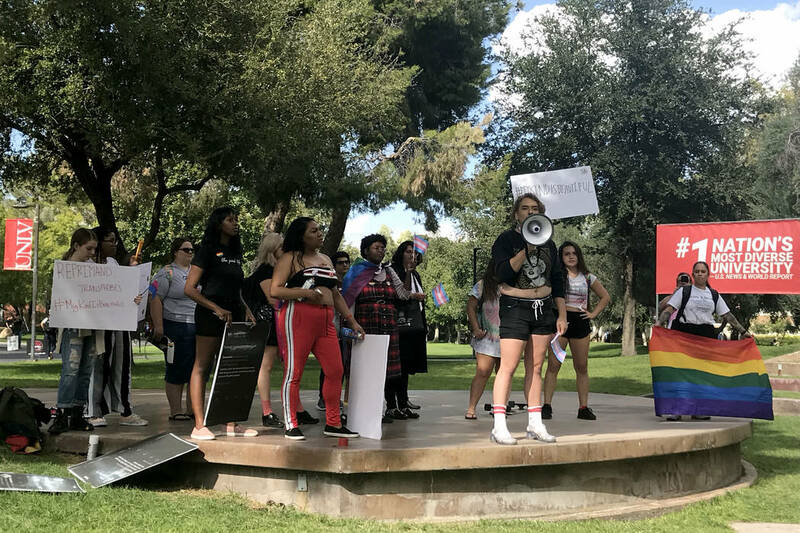 Thursday’s protest began with the group of students marching and chanting, “We’re here, we’re queer, we’re fabulous,” along with another phrase that included profanity. While the protest did not become violent, there were moments where the protesting students shouted at members of the fraternity in the crowd of about 200 to stop laughing. Kostan also presented the list of other demands. The students are asking the university to require comprehensive diversity and inclusion education for all students. Kostan said this could be accomplished by requiring students to take a women’s studies course. “I know that my story is just one example of the many of stories that are out there for queer folks who continue to be disregarded on campus,” Kostan said. They also want Kappa Sigma to apologize and for UNLV to give a public statement and apology.